It’s getting close to the most dreaded time of year for most folks: Tax time. April 15 will be here before you know it. Will you be prepared, or will you be scrambling to locate every last receipt and scrap of paper? For us, tax time means one thing: REFUND. We always get some sort of refund, whether $8 or $1500, but this year, we qualify for the $8,000 first time homebuyers tax credit, deductions for mortgage interest and property taxes, energy tax credits for our new windows, and a deduction for the state sales tax we paid on the new vehicle we purchased back in April. But it will be the most complicated return we’ve ever done, and I’m going to have to do some solid research so I can find out the proper way to file everything we qualify for. That being said, sometimes doing your taxes can be a head-scratching, hair-pulling match, as you wrestle with numbers and figures — but it doesn’t have to be if you follow two rules: BE PREPARED and STAY ORGANIZED. The following tips can help make the process smoother and less stressful. Make a “tax” folder. Not a computer folder — a real one. Use a manila folder, pocket folder, accordion file — whatever floats your boat — and keep it accessible. 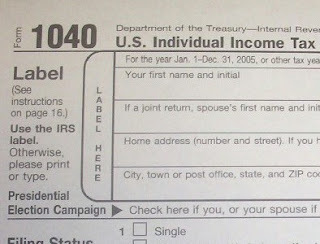 As the W-2s, 1099s, 1099-INTs, 1099-Rs come rolling in, add them to the 2010 tax file. When it’s finally time to do your taxes, everything will be in one place. We’ve already gotten our mortgage interest 1099, so I’ve begun our file. The IRS and State of NJ mails our main tax return publications and forms right to our home. If you’ve moved, or you haven’t received yours in the mail, head to your nearest U.S. Post Office to grab copies for your use. Consider it the only freebie you’ll ever get from the IRS! Determine the main form you’ll need, such as a 1040EZ or a standard 1040, and gather any extra forms/instructions such as worksheets and schedules. All forms and publications can also be printed from the IRS.gov website. There is a number of tax filing software available on the market today, with one of the most popular being TurboTax. You can also file online through the IRS’ e-File program (if you meet certain salary criteria). Check the regulations in your individual state to see if you’re allowed to file your state return electronically or by phone. If you can’t bear the thought of trying to navigate the U.S. tax code and are confused by all of the statements you’ll be receiving in the coming weeks, consider using a professional to make sure you’re getting all the credits and deductions you qualify for. Ask friends and family to recommend a tax accountant or a tax preparation service like H&R Block or Jackson-Hewitt.